Millions of people across the UK are turning their backs on the more traditional forms of window dressings and opting for the more practical and stylish alternative of plantation shutters – a trend that has been highlighted in the Sunday Times by respected writer Caroline Scott, and a trend that Totally Shutters have been at the forefront for over 15 years. Why are shutters taking the country by storm? America embraced the plantation shutter trend long before Britain, with 40% of American homes having shutters compared to around 10% in Britain. But now plantation shutters sales in the UK are continually growing year-by-year at a rate of 35%. 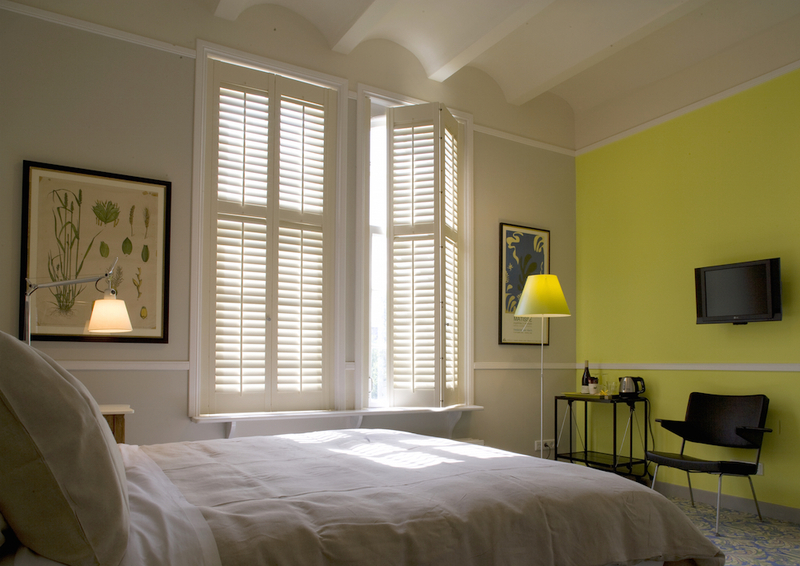 Before Totally Shutters was founded, plantation shutters were considered an ‘extravagant’ product seen only in designer homes and luxury hotels. But in recent years, shutters have become more available and their popularity has risen as homeowners of all types of properties are realising their benefits and value. Plantation shutters are seen as an investment, lasting a lifetime while adding value to your home. They are just as practical as they are beautiful, improving privacy, reducing noise and allowing ambient light. They are easy to clean, hardwearing and do not warp or fade in the sun. What’s more, plantation shutters can be custom made to fit any type of window, including bay windows and shaped windows such as circular windows. They come in a variety of styles such as tier on tier and cafe style. They’re also available in a wide range of different wood options and finishes, with choice of slat sizes. 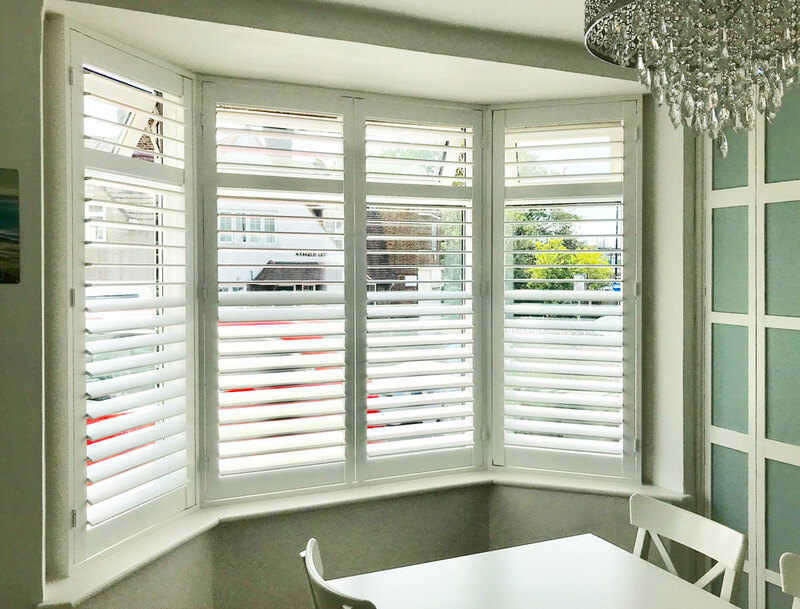 If you’re considering plantation shutters for your home or business, contact Totally Shutters on 0203 960 69 63 to discuss the shutter options available for your home and for your free no-obligation quotation. 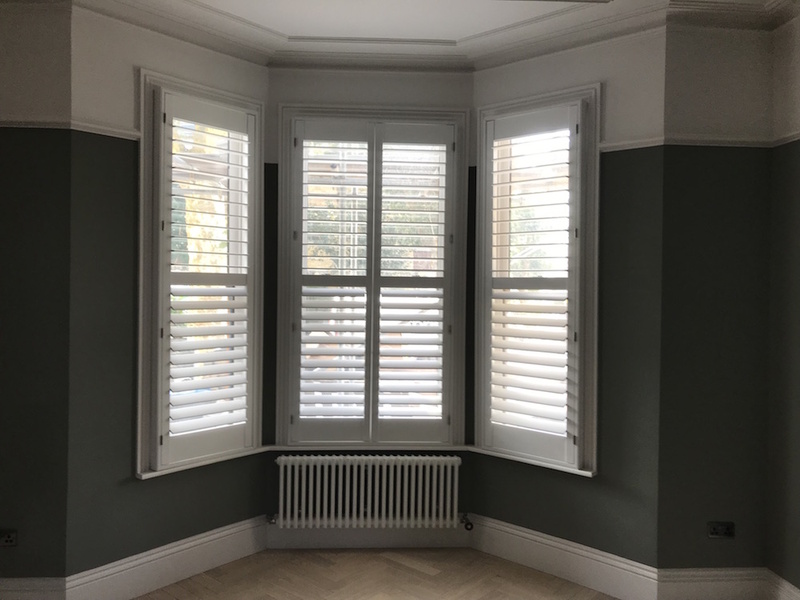 If you’re looking for plantation shutters in London, look no further than Totally Shutters – London’s fast-growing shutter blind manufacturing company with an unrivalled reputation for supplying the finest quality window dressings to residential and commercial properties around London, Kent, Surrey, Essex and throughout the UK. Totally Shutters strive to maintain a high standard at all time while providing shutters at competitive prices. 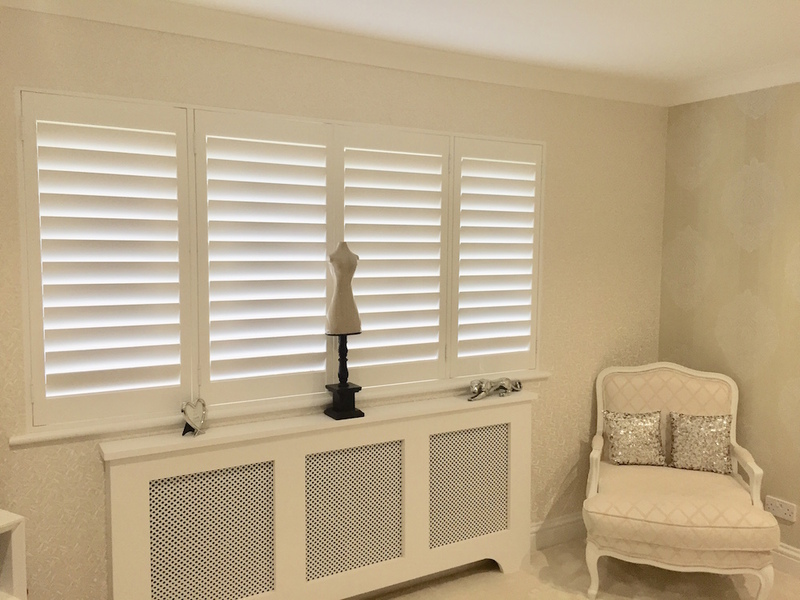 With over 15 years of experience within the window blind and interior design industry, Totally Shutters have supplied plantation shutters to homes throughout the UK. Our range of window shutters has been expertly designed with your comfort and convenience in mind. So whether you’re looking to enhance your privacy, add style to your home or prevent harmful UV rays from damaging your furniture, we have a shutter blind solution for you. At Totally Shutters we provide a first-class service from start to finish to all of our customers in London and surrounding areas. We make buying window shutters as simple and as straight-forward as possible, that’s why we offer a free, no-obligation in-house survey. Our free, no-obligation in-house survey allows you to choose your shutter blinds in the comfort of your own home. During your in-house survey, one of our professional surveyors will bring lots of shutter samples for inspiration and discuss the various shutter options available for your home, before taking the measurements of your windows. With a wealth of experience in creating, manufacturing and fitting shutters in London and around the UK, you can sit back safe in the knowledge that your shutters will be right the first time. If you’re looking for plantation shutters in London, call Totally Shutters on 0203 960 69 63 for your free, no-obligation quotation. Alternatively, if you would like an estimate costing of your shutters beforehand, please go to our quick quote service or give us a call with your window dimensions and we will give you a quote for your chose shutters over the phone. As a business owner, it’s important to create a happy and safe work environment for your employees, designed with maximum productivity in mind. And a happy and productive workplace starts with your window dressing option. Many business owners turn to vertical blinds for their window solution, but vertical blinds can look tiresome, dated and often don’t stand the test of time with panels falling out of place, discolourment, tears and rips, and they can be difficult to clean. As a more stylish and practical option, office shutters are becoming an increasingly more popular option for the workplace as they offer exceptional privacy and security while providing ample control over light levels. With office shutters, you can easily adjust the louvres to any position you want, changing the incidence of sunlight in a way that does not shine in your employee’s eyes, face or monitor screen – the ideal solution for working on computers in bright sunlight. The best workplace environment encourages productivity and helps you concentrate. Shutter blinds add an insulating layer to your window, helping reduce external noise levels and minimise distractions. If your office is overlooked by nearby properties, or on a busy road, shutters can provide the privacy your employees need to work effectively. Tilting the louvres to an angle can help hide your office equipment, such as computers or invoices, without losing the natural light filtering into your space. Office shutters are brilliant insulators, providing an extra layer of insulation during the Winter and deflecting sunshine, cooling the room in the Summer. As a result, office shutters are energy efficient, reducing heating and air conditioning costs. 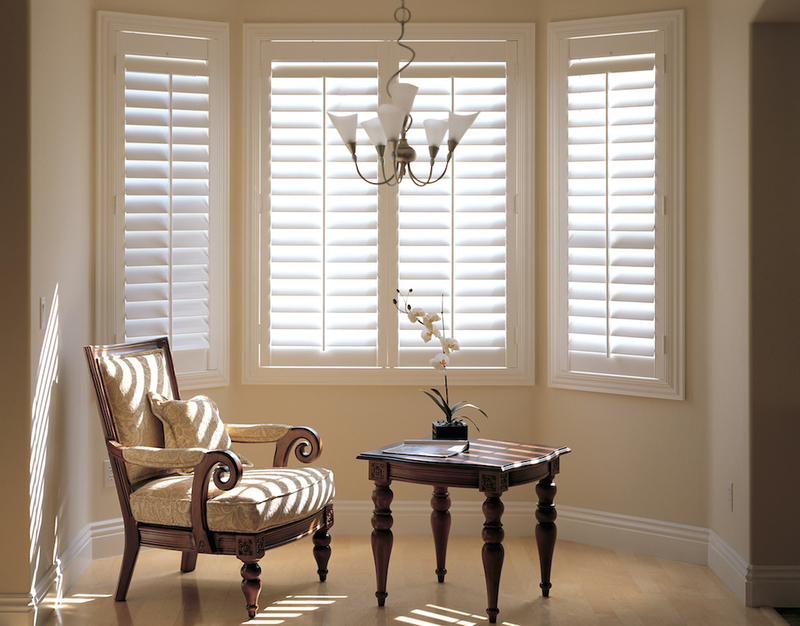 Available in a variety of styles and finishes, as well as mounting options, shutters are an extremely appealing option. Office shutters add a stylish touch to your office, enhancing the decor and improving the workplace environment. Office shutters are durable and built to last, making them less expensive than other window coverings as they won’t need replacing every few years. They’re also low maintenance, requiring a quick wipe down with a damp cloth from time to time. If you’re looking to spruce up your workplace with office shutters, look no further than Totally Shutters. Call on 0203 960 69 63 for more information or to inquire about your interior shutters for your office. All shutters from Totally Shutters come with a 5-year guarantee. It’s estimated that one infant is strangled to death every month in the United States from window blinds. As this has become such a widespread issue, megastores such as Ikea and Target have removed corded blinds from their shelves, with other big stores such as Walmart to follow. Unfortunately, accidents caused by window blinds are also a big issue in the UK, with the Royal Society for the Prevention of Accidents (RoSPA) finding at least 18 child deaths have been caused by blinds since 2010. A report from Chief Medical Officers suggests that there are millions of unsafe blinds in homes across the UK which could be the cause of future tragedies. Why are window blinds hazardous? Young children are naturally inquisitive and as their mobility increases, so does the danger in everyday items such as window coverings. Although the age of children at risk extends from 7 months to 7 years old, the average age for a catastrophic accident is 23 months. At 23 months, the child’s muscular control has not yet fully developed, limiting the infant’s ability to untangle themselves. As well as this, young children suffocate much faster than adults, meaning there is less time to save them. There has always been a debate on whether shutters or blinds are the better window covering, but when it comes to child safety, the better and most safer option is shutters. With no cords, braids, loop chains or wires to form potential strangulation, shutters are the perfect choice to keep your family safe. Utilising a tilt rod mechanism, shutters are a more stylish and safe alternative, suiting both modern and traditional homes. Shutters are also fully compliant with EN13120. At Totally Shutters, we understand how important it is to keep your child safe, that’s why we only manufacture shutters that are 100% child safe. Our entire shutter range is child safe, as they don’t have any cords or lose ties, making our shutters the perfect window solution for homes with young children. For more information on our shutter blinds and how child safety is paramount in each of our shutter products, call us today on 0203 960 69 63. So your plantation shutters have been measured and delivered, and now it’s time to install them. 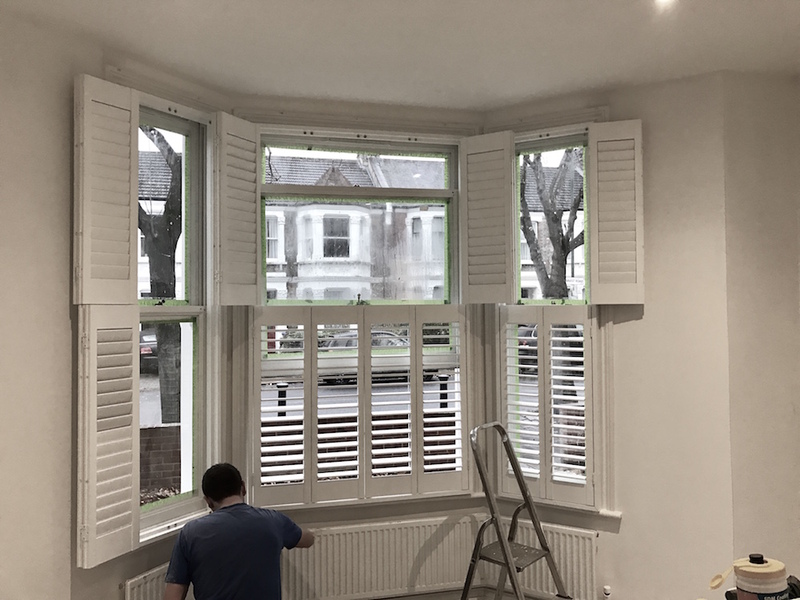 Of course, at this point, it’s not too late to ask one of our expert fitters to install them for you – many of our DIY clients have regretted that they didn’t opt for our fitting service, but it is possible to install your shutters on your own. Once you have the appropriate tools at hand, clear your working space, ensuring all furniture and furnishings are out of your way. Carefully open and layout your shutters, positioning the frames around the panels, sliding the corners together to your complete shutter blinds. Once you’ve assembled your shutter blinds, lift your frames into place (you may need a second pair of hands to help you with this). Depending on the style of your shutter, you will need to create some fixing holes by partially drilling the screws in. Once you have your fixing holes, remove the screws and the frame, then drill a full hole and insert your raw plug. Next, place the frames back on the window space, making any required adjustments to the spacing and the positioning before securing the hinges in place with a screw. If you have any gaps around the frame, seal them using decorator’s caulk, using a damp cloth to wipe off any residue. If you get stuck while installing your plantation shutters, call Totally Shutters who will talk you through the process over the phone. Alternatively, call 0203 960 69 63 for more information on our shutter blinds. All shutter blinds from Totally Shutters come with a 5-year guarantee. Plantation Shutters: DIY or Leave it to The Experts? Do-it-yourself plantation shutters may seem like a great idea on paper – a stylish and contemporary window covering that you can fit in your spare time, saving money too. But is it really that straightforward, or could made-to-measure shutters fitted by a specialist be better in the long run? The pros of DIY shutters concern mainly price, as they’re less costly than made-to-measure plantation shutters from a professional company such as Totally Shutters. However, if your budget will only extend to DIY shutters, they’re a more fashionable and practical solution than roller blinds or curtains. But while DIY shutters may seem like the better, cheaper option, there are many flaws to this approach that can go wrong. Unless you have considerable DIY skills, using a shutter specialist will make your shutters are worthwhile investment in the long run. Measuring for your DIY shutter blinds can be harder than you think, with so much to consider including window hight, window width, recess depth, frame size, angles, handles and latches, measuring can be complicated and miss-measuring will lead to incorrect ordering, difficult fitting and amendments will be time consuming and are unlikely to be covered by product warranty. And then assembling and mounting your DIY shutters to your window frames can be difficult, especially if the measurements are slightly out. That’s why it’s always a good idea to get quotations from specialist shutter suppliers such as Totally Shutters, to see how made-to-measure shutters can compare. 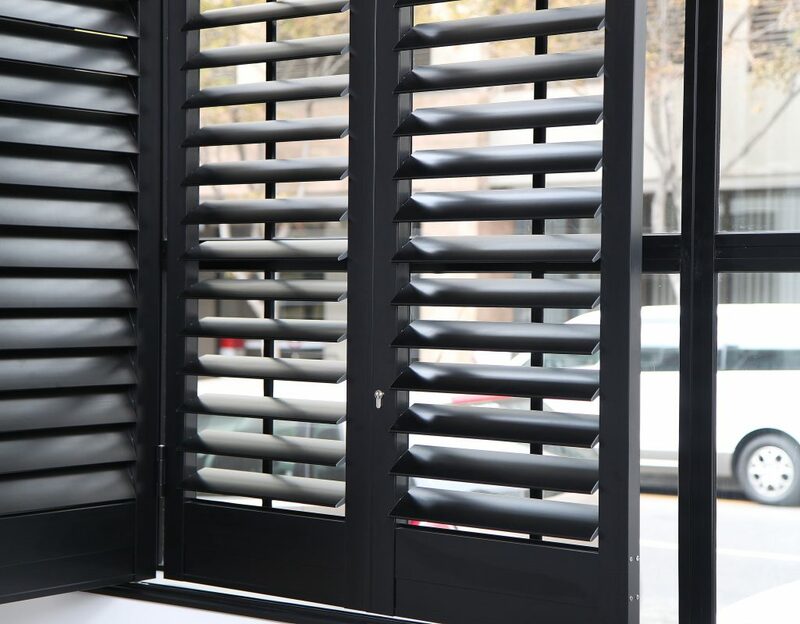 It may seem like there is a wide range of options available for DIY shutters, but you may, in fact, be restricted to kits or templates. At Totally Shutters, we offer a wide range of choices, including a custom colour service that matches the colour of your blinds to virtually any shade, so you can sit in the knowledge knowing your blinds will be made and fitted to a high standard. At Totally Shutters, we offer a do-it-yourself discount for fitting your own shutters and it is possible to fit our shutters yourself. However, its only recommended for those with considerable DIY skills. We will check, measure and guide you through the process of installing your shutters yourself, or you can leave the whole installation process to us. For a free in-house survey and appointment call Totally Shutters today on 0203 960 69 63, with no obligation to buy, you can explore the plantation shutters choices available for you in the comfort of your own home. Open plan living is a popular option for many homes, creating a minimal and contemporary space where the whole family can be together. But although stylish, there may be times when you need privacy. 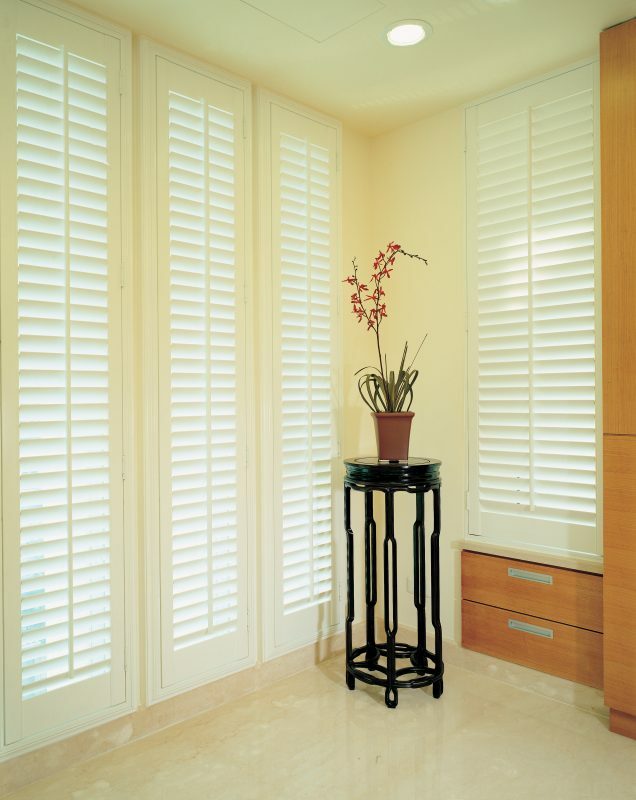 Plantation shutters as room dividers help divide rooms and provide the privacy required. So if you love your open plan area, but want the added option to divide it at the same time, plantation shutters may be the solution for you. 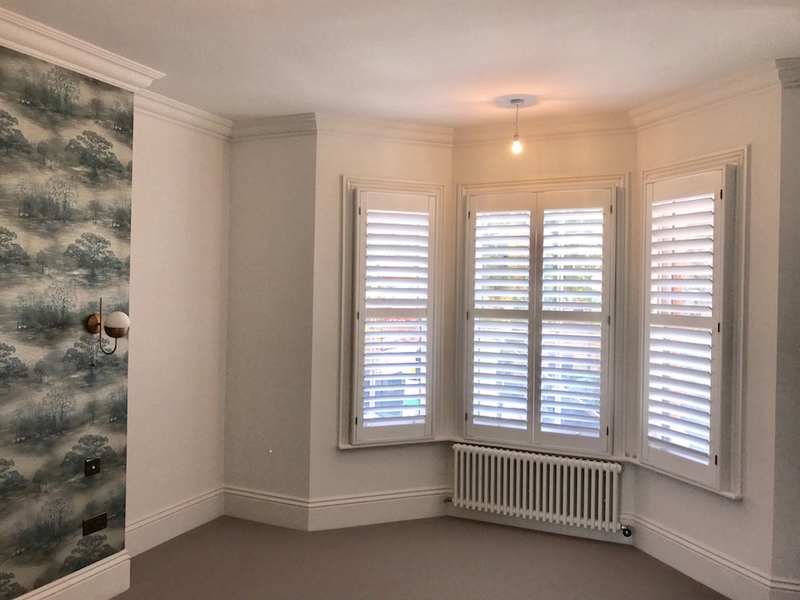 Using plantation shutters to segregate your open plan space is a much cheaper solution than constructing a new wall and offers greater flexibility. As with shutters, you can have your room completely open or create separate rooms for privacy, alone time, studying or storage space. And by opening the louvres of the shutters, you can have the option to have open plan and separate at the same time. Made-to-measure plantation shutters can be created to divide a range of interior designs and not just open plan. Track systems allow for easy operation and can be used for covering patio doors, large windows and cupboard doors. Track systems can be put in place to help close up a room such as a kitchen or en-suite bathroom by partitioning off space when required. This allows the shutters to be folded out of the way when easy access throughout the open plan area is required. Plantation shutters reduce air flow when closed, keeping spaces cool or warm, and limit the volume of noise spreading through the home, allowing for a much nicer living solution. 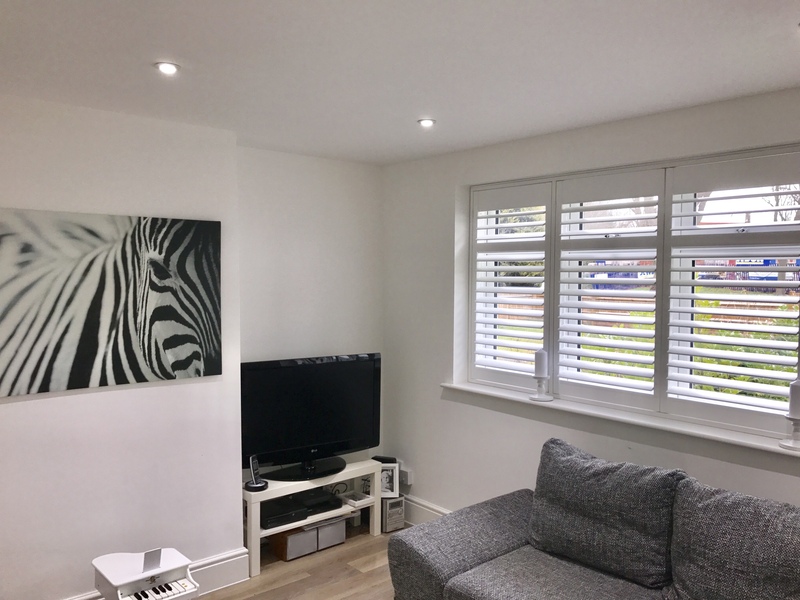 Plantation shutters are a simpler choice for dividing up your open plan space and can be matched to any existing window shutters in the home to provide a consistent look and feel throughout the property. Totally Shutters also offer a colour match service that provides the perfect match to any interior. If you have an open plan space and want to learn more about using plantation shutters as room dividers, call 0203 960 69 63 and speak to the Totally Shutters experts today. School is out and the British Summer heatwave has been forecasted to make a return next week. Although great for those planning a staycation in the sun, the scorching weather, sticky heat and brighter, longer days can be troublesome for many Brits, particularly shift workers and children who are accustomed to sleeping during the day. So how can you create the perfect sleeping environment be created come day or night? An increasing amount of studies mean as a nation, we’re becoming more aware of the importance of a good nights sleep. As we recognise the benefits of resting well, we’re understanding the perfect bedtime routine should be combined with exercise, relaxation and healthy eating. When it’s daylight time, our bodies assume its time to be awake. In the mid-to-late evening, the body realises a hormone called melatonin which helps control your daily wake-sleep cycle, relaxing the body and mind, helping us to drift off. It’s, therefore, no surprise that many of us struggle to sleep when it’s light outside. By investing and making a few changes in our bedrooms, we can help our bodies overcome this daily release of melatonin and positively impact the way we sleep. By changing the temperature, switching off electronic devices and blocking out sound and light, we can create the perfect sleeping environment. The shutter and shade range from Totally Shutters help transform your room as dark as possible, blocking out all external light leaving you to enjoy a well-earned quality sleep, no matter the time of day. Unlike traditional blackout blinds, blackout shutters from the shutter and shade range has an integrated room darkening blind which helps to blackout 99% of all external light and nose while providing complete privacy, making them the ideal addition for bedrooms and nurseries. Available in a range of colours, the shutter and shade combo is practical and styled to suit your interior and transform your home. Getting the best environment to sleep means taking into consideration light levels, temperature, furnishings and furniture. Blocking out all external light can make all the difference when getting the perfect summer’s sleep, call us today on 0203 960 69 63 to learn more about blackout shutters and our shutter and shade collection. The UK weather has defined all expectations so far, with scorching temperatures engulfing the country throughout the first half of summer. Now weather forecasters have told Britons to “stay out of the sun” from now until Friday as the Met Office has issued an amber heatwave alert as the hottest day of the year is on track to beat all records. The warning is in place until 9 am Friday, as temperatures continue to sizzle. But with homes feeling uncomfortably sticky with the heat, how can Britons stay out of the sun while keeping their rooms cool during this scorcher of a summer? The key to keeping the temperature of your home low is through proper ventilation. For many families, this means opening curtains, raising blinds and opening all windows. However, by doing this, you’re allowing sunlight to enter and heat up your home. Not to mention, your window coverings will be bouncing around, damaging your interior and making a racket. Direct sunlight can warm your home, countering the ventilation created from the opened windows. Shutter blinds allow you to open up your windows while the shutters itself can be left shut and adjusted, allowing you to gain airflow throughout your room as well as blocking out harsh direct sunlight. Shutters prevent your interior from being damaged by direct sunlight and allow for complete privacy during the warm summer months. This is incredibly important as property crime increases during the warmer months. Shutters are not only great for summer but winter too, as they keep the warm air in and the cool air out. Plantation shutters from Totally Shutters come in many different styles. Our most popular style is the full-height shutters which run the whole height of your window and can be fully opened, closed and adjusted. Tier-on-tier shutters are also a popular option as they include all the functionality of full-height shutters with a split in the middle, creating a top and bottom section of shutters for ultimate flexibility when it comes to airflow and blocking out sunlight. If you would like more information on how plantation shutters can benefit you and your home in summer and throughout the rest of the year, call us today on 0203 960 69 63.